Know someone who loves to practice the art of bonsai? Here are ten suggestions of gifts they are sure to enjoy. Whether you're trying to keep soil off your clothes or cooking up dinner, the Bonsai Apron will keep you clean. 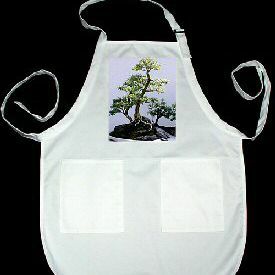 The 22"W x 30"L white apron features a photograph of a bonsai tree, 2 pockets, 1" ties and an adjustable neck strap. 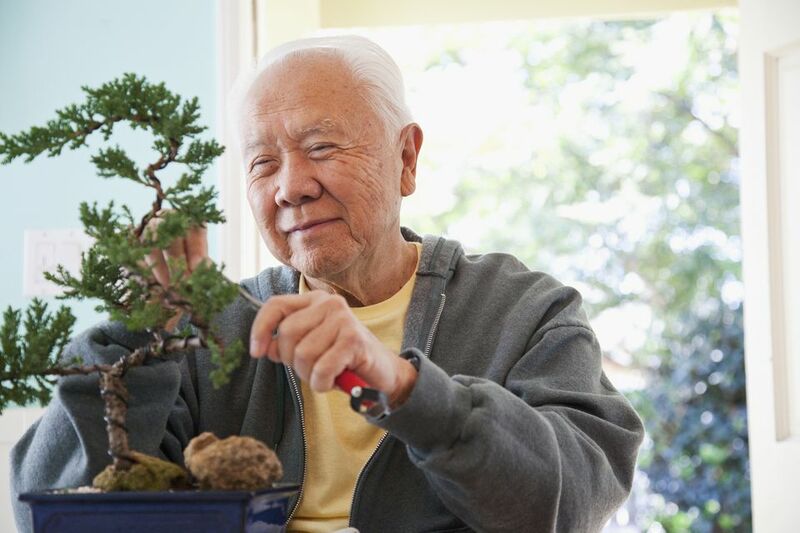 Bonsai Workshop - Styling and Training by Herb L. Gustafson was written to help your budding bonsai fan learn how to create, maintain, and display their bonsai. The Glass Monkey Figurine whimsically portrays the saying "See no evil; Hear no evil; Speak no evil". It comes with a separate wooden display stand. The Handmade Cork Carving of an Oriental scene comes displayed in a black lacquered case. Everyone will know you're a "Bonsai Master in Training" when you wear this shirt. Comes in size XL. Start your bonsai off right with 2 pounds of flashed fired soft volcanic clay soil. The Jump Start Grow Light System allows you to give bonsai trees and other plants more light than they are able to get indoors. It measures 51" long, 18.5" wide, 31" tall, and is adjustable. This Tool Case will help keep your bonsai tools safe from rust and scuffing. It is made of brown vinyl and is designed for heavy outdoor use. Want to send someone bonsai but are on a budget? Choose one of these bonsai trees under $30. Which Petunia Is Right for You?